Printed and published by Joseph Mansell using George Baxter's patented Baxter Process. Size 11 x 15.5 cm approx. 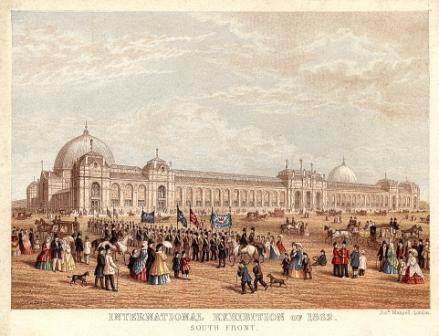 This print shows the building in South Kensington, London where the 1862 International Exhibition was held. The exhibition was opened on 1 May and ran for six months until 1 November. It was organised by the Royal Society of Arts, Manufacturers and Trade, featuring over 25,000 exhibitors from 36 countries around the globe. It is said to have attracted over 6 million visitors.